Patchwork Challenge Update: A guest blog from Paul Parsons- the last one! In the last two months of the year I added 4 species to my bird list, giving me a total of 94. These were a Woodcock on 4th November, Mute swan on 18th, Tawny owl on 4th December and Fieldfare on the 24th. Birds seen on the reserve that I missed during the year included Common sandpiper, Greenshank, Hobby, Little owl and Jack snipe. My highlights of the year were Osprey, Glaucous gull, Yellow wagtail and breeding Little ringed plovers. I enjoyed the challenge but will not be doing it again this year as I found it a little restricting on the way I normally bird watch, which involves a lot of coastal birding. Parc slip is a marvellous local reserve though and I will still be visiting on a regular basis. I particularly like the varied insect life there and was delighted to find the reserve's first Brown argus butterfly in the summer, along with a first for Glamorgan, the Alder signal moth. On reflection I really enjoyed the year, although September was too settled weather wise for our main migration period, meaning birds passed through without stopping, and the last two months were very quiet and mild, lacking a good cold snap to push some new birds in. We at Parc Slip would like to thank Paul very much for choosing Parc Slip as his Patchwork Challenge area- it's been fantastic to hear about everything he has seen and we look forward to seeing him on the reserve again soon. Iolo Williams spent his 'Perfect Day' at Parc Slip, see the video below. September and October are usually good for migrants, with a fair chance of finding something unusual. 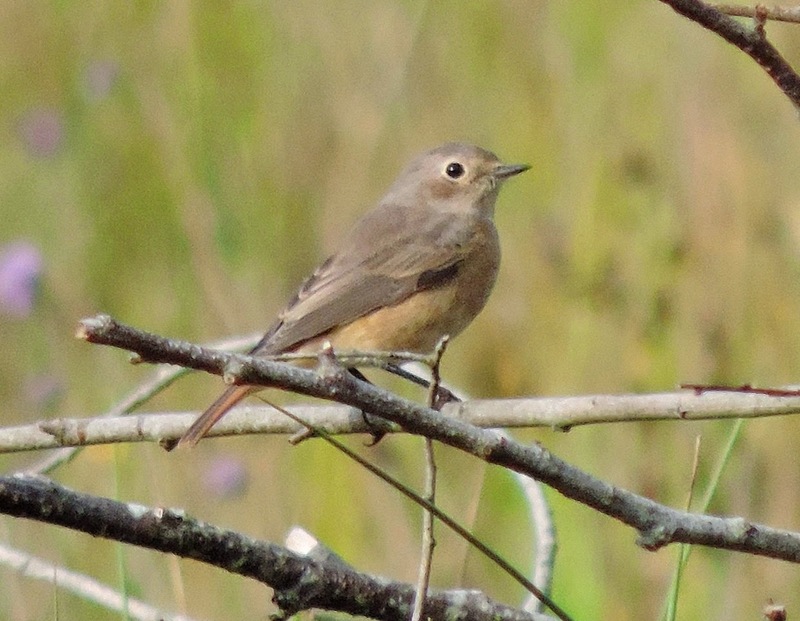 However, September was so mild and sunny that very little bird passage was noted on the reserve. Moorhen and chick. Paul Parsons. Highlights were a Tree pipit and three Sand martins on the 2nd, a Chiffchaff and a small influx of Robins and Thrushes on the 3rd and Willow warbler and Sedge warbler on the 5th. 6 Teal were new in on the 7th and a Common snipe was seen. A new species for the list was Yellow wagtail- three were spotted on the new scrapes on the 9th. On the 17th, flocks of Swallows and House martins were seen heading south, Blackcap and Sedge warbler were sighted, Teal numbers were up to 18 and 20 Meadow pipits were in the fields. On the 22nd a juvenile Water rail was on the Visitor Centre pond. A female Wigeon on the Northern Wetlands on October 10th was my 90th bird of the year and on the 11th 7 Goosander flew over the café and the first Redwings of the winter were seen. The rest of the month was quiet but a Hobby was reported on the 17th on the Northern Wetlands. NB. Paul is currently taking part in the Patchwork Challenge, where birders go out in their local area to spot as many birds as they can. He has chosen Parc Slip Nature Reserve as his patch. Read more about Paul's progress in the older posts on this blog. The Lapwing is an iconic farmland bird which has undergone drastic declines in populations as a result of loss of breeding habitat. 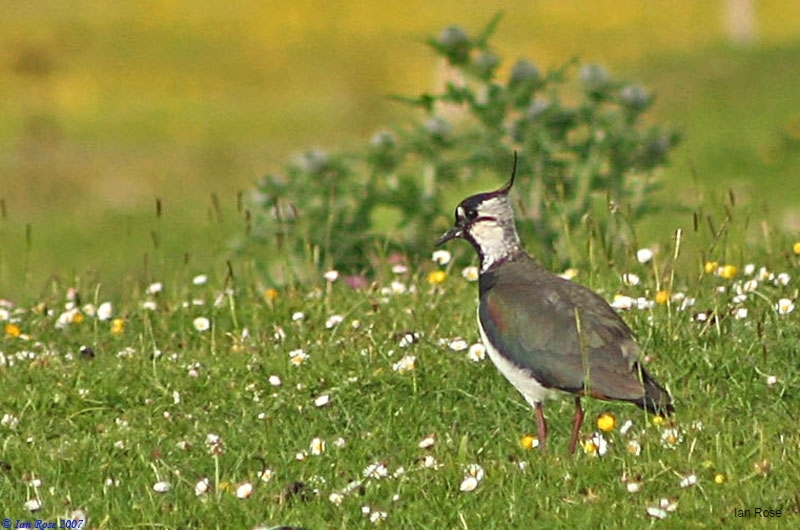 Today the lapwing is a U.K. and Wales priority species requiring urgent positive action. 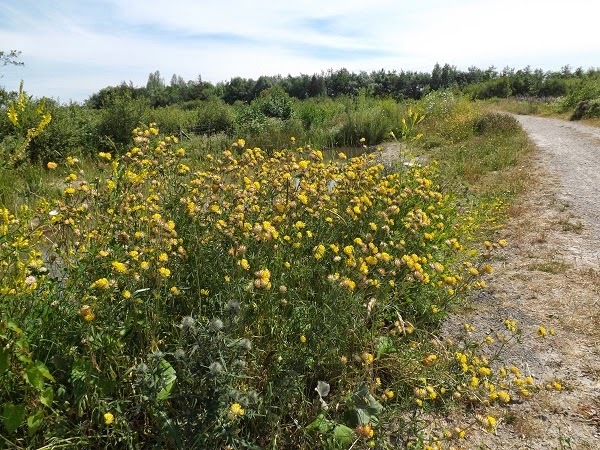 Over the next few months, we will be working hard to reverse the decline at Parc Slip Nature Reserve, through a series of habitat creation and management projects. These will include the creation of wetland scrapes and cryptic nesting sites to the appropriate management of wetlands, meadows and arable fields. 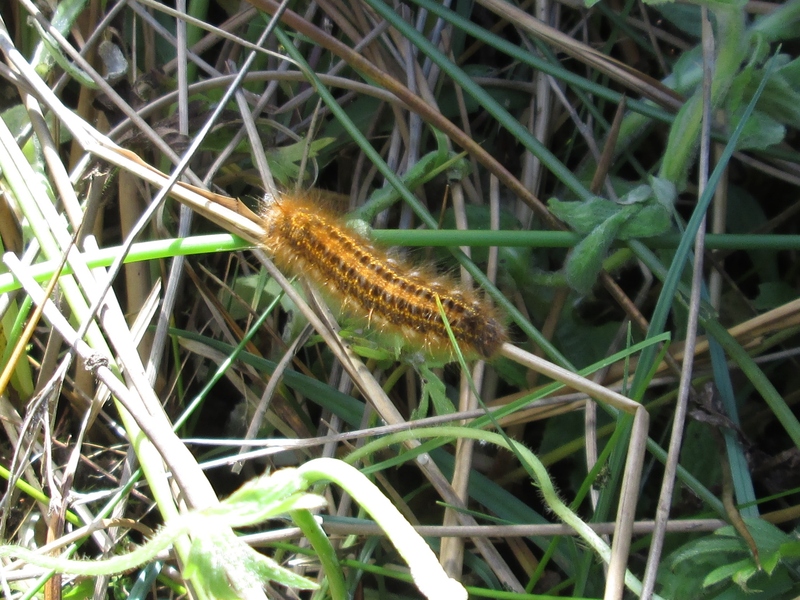 In addition to the practical habitat management and creation, the project will also undertake research and monitoring on the reserve and in the wider landscape to better understand and conserve the species in Bridgend. One of the objectives of the project is to remove scrub from breeding grounds. 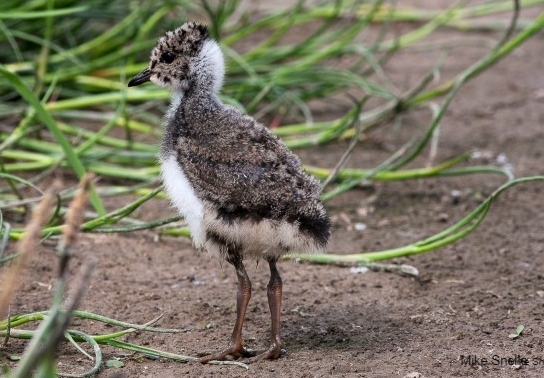 Lapwings nest away from scrub as it harbours predators. Therefore the removal of scrub in key breeding sites increases the overall suitability of the nesting ground. Over the past 10-15 years the main breeding grounds and other outlier sites at Parc Slip have become encroached with scrub and immature woodland and we need your help to remove it! 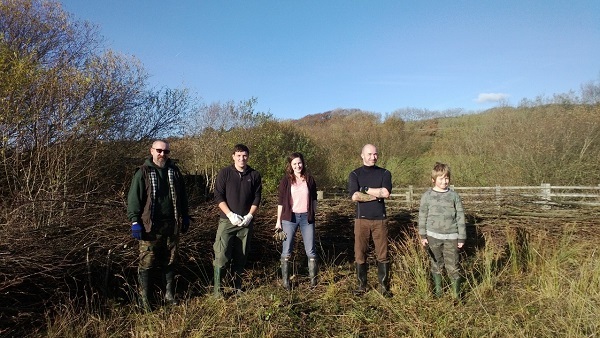 If you would like to help us with this project, send Rose an email or ring 01656 724100 to register as a volunteer or come along to our next Lapwing Conservation Day on Friday 10th October 2014 at 10:30am. May at Parc slip was quiet on the passage bird front. I spent the middle two weeks on a birding trip to China and as far as I know, I only missed out on a Common sandpiper which was found on the wader scrapes. During May and June I saw nothing new for the list but it was good to see 2 pairs of Little ringed plover successfully breeding on the new scrapes, with newly hatched chicks seen on 6th June. July started quiet too with nothing new until the months end when a Greenshank and Green sandpiper were reported from the scrapes, I did manage to see the Sandpiper the next day but the Greenshank had moved on. Also a pair of Tufted duck had 8 ducklings on the Northern wetlands. August was better, with some autumn migration evident towards the months end. I saw my first Collared dove of the year on 3rd and Grey wagtail and Redstart were added to the list on 14th. 2 Tree pipit and a Lesser whitethroat were new in the Willows at the end of the canal on 19th and a Common snipe dropped onto the wader scrapes on 21st. Finally 3 Spotted flycatchers were new on 31st, taking my total to 88 for the year. Migration will be in full swing for the next 6 weeks and hopefully something good will turn up after the forecasted easterly winds this week. The small blue butterfly (Cupido minimus) is the UK’s smallest butterfly, with a wingspan of only 16-27mm. It’s a beautiful little butterfly, recognised by the dark blue on the upper surface of its wings and dark spots on the silver-blue underwing. 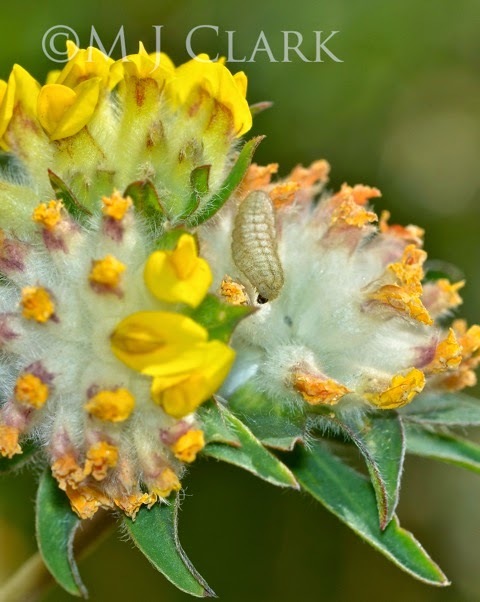 It flies from mid-May to August and lays its eggs on the caterpillar food plant, kidney vetch. As is the story with much of our UK wildlife, unfortunately the small blue has experienced a decline in both population and distribution over the whole of the UK. This decline has been noticed locally, with the number of adults seen at Parc Slip Nature Reserve outside Bridgend in South Wales slowly reducing over the years. 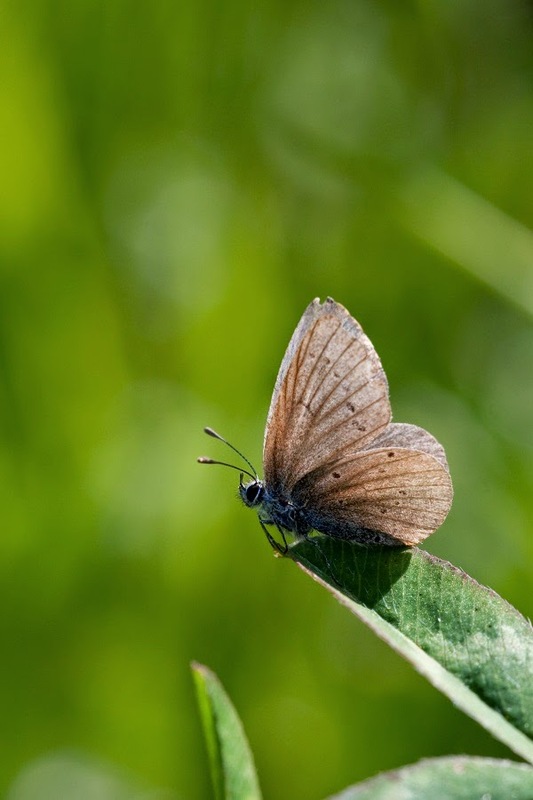 In 2012, the Wildlife Trust of South and West Wales enlisted the help of local Bridgend school children to improve the habitat for small blue on Parc Slip to see if we could boost populations on the reserve again. 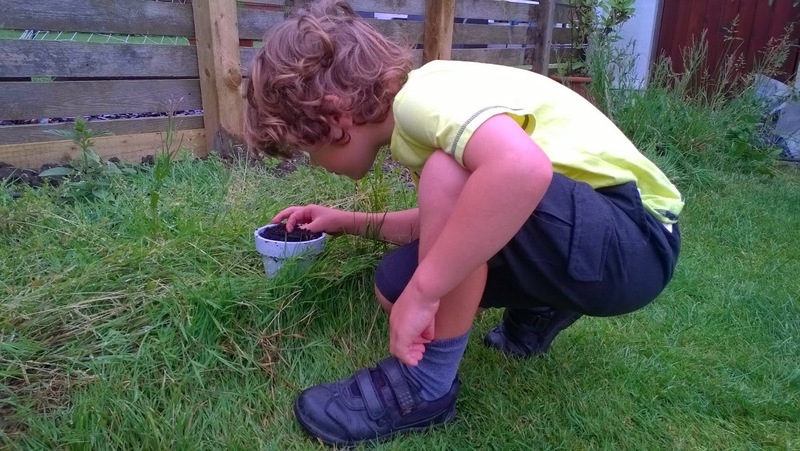 Kidney vetch seeds and planting kits were sent out to two local primary schools, Oldcastle and St Roberts, where the children planted the seeds and grew them in their classrooms. Once the seedlings began to emerge, the plants were brought to Parc Slip and planted out on the reserve. The large majority were planted on the banks of the new pond near the Northern Wetlands hide and they have been a huge success, growing very tall indeed. Now we have some very good news to report! The kidney vetch has been growing steadily over the last two years and this year has produced a wonderful display of flowers. On Friday 20th June, staff from the Wildlife Trust were thrilled to find a female butterfly near the kidney vetch. 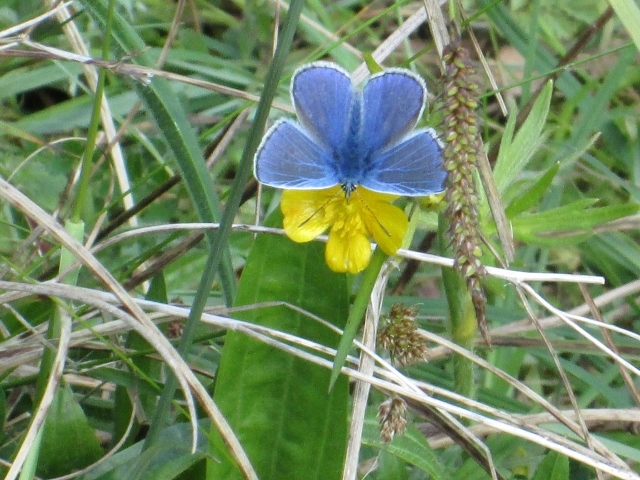 Since then, numerous larvae have been found feeding on the kidney vetch and there have been a number of reports of small blue on the nature reserve by visitors. Thank you very much to the local school children for planting and growing the seeds in their classroom, and to Biffa for funding the project. I was lucky enough to go on my second ever Reptile Ramble last Wednesday, at Parc Slip nature reserve. Some of the pictures are a bit blurry, sorry. 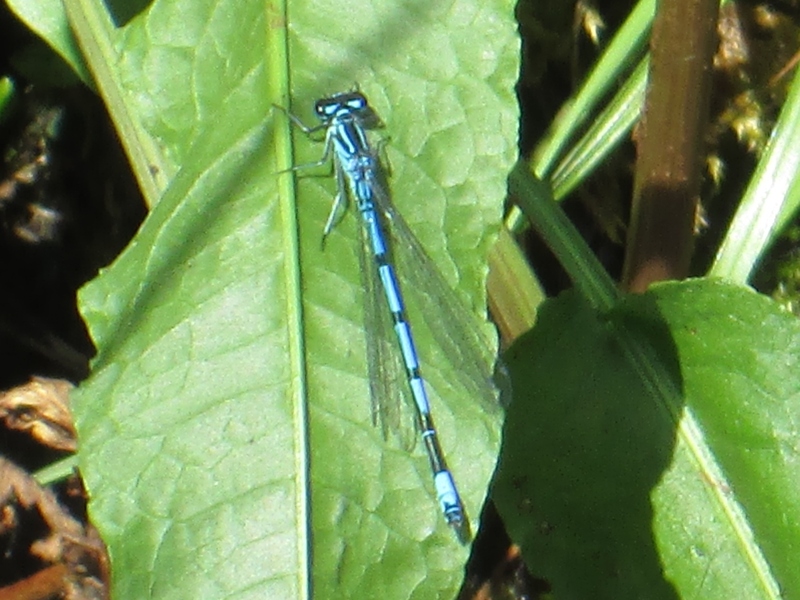 It was impossible to see whether they were in focus at the time, due to the strong sunlight (nothing to do with my woeful photography skills – cough, cough). 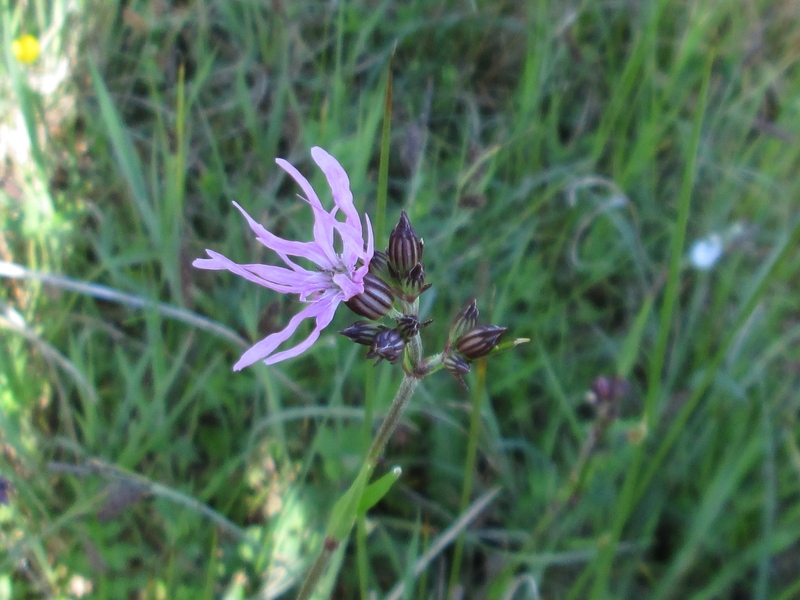 Lady’s Smock, Ox-eye daisies, Cowslips and beautiful Ragged Robin were just some of the gorgeous wild flowers we saw. 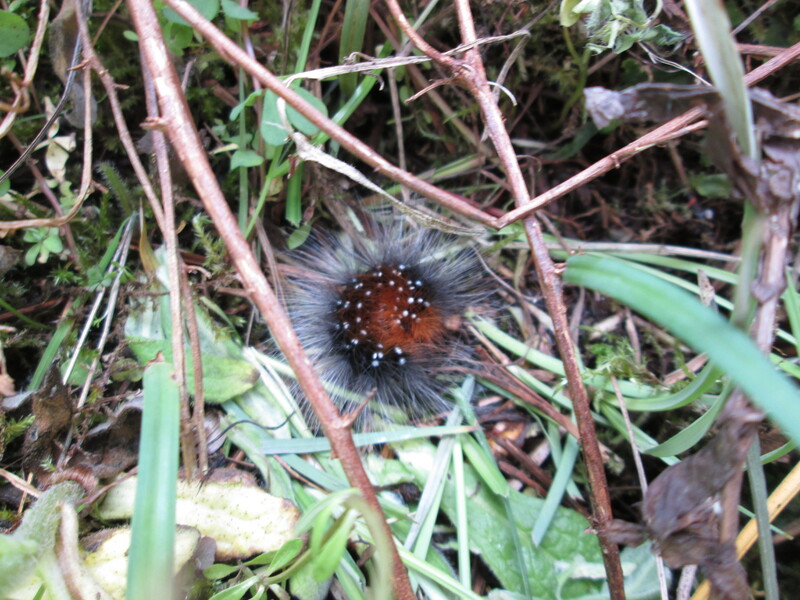 Plus this beauty, which I’ve been reliably informed (by twitter) is a Garden Tiger moth caterpillar! Glad I didn’t pick it up! Dingy Skippers Common Blues and Green-veined White butterflies were everywhere. Also saw a Small Copper, and Rose (the walk leader) pointed out some Orange Tip eggs on the underside of Lady’s smock. 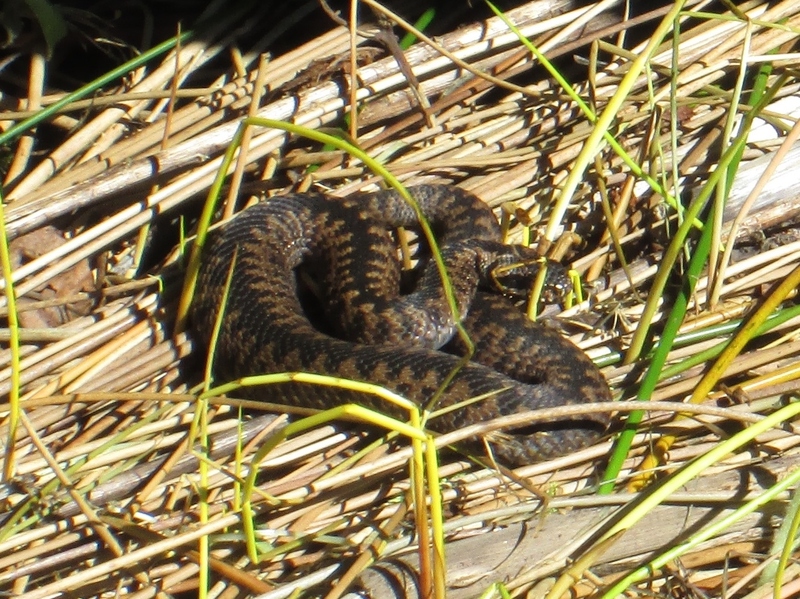 We were lucky enough to see three adders, one female and two male. 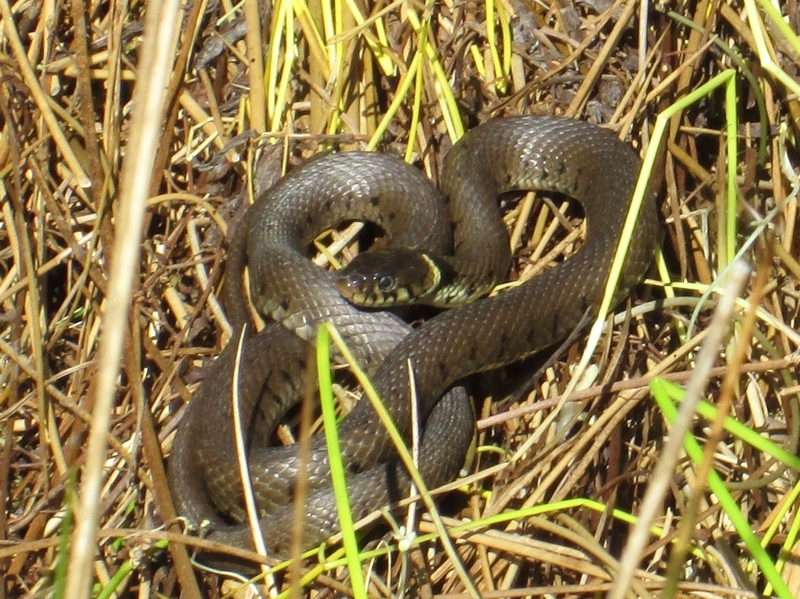 We also saw grass snakes, one of which stayed still long enough for a photograph. 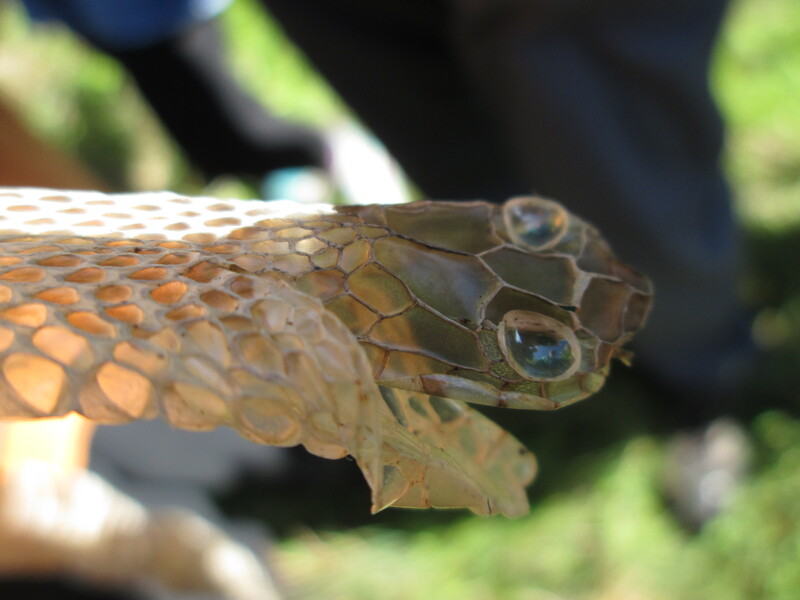 This is the shed skin of a grass snake, showing the eye scales. To find the whole skin intact is apparently quite rare, so we were extremely lucky to see it. What a fabulous face. Wish I could have kept it! 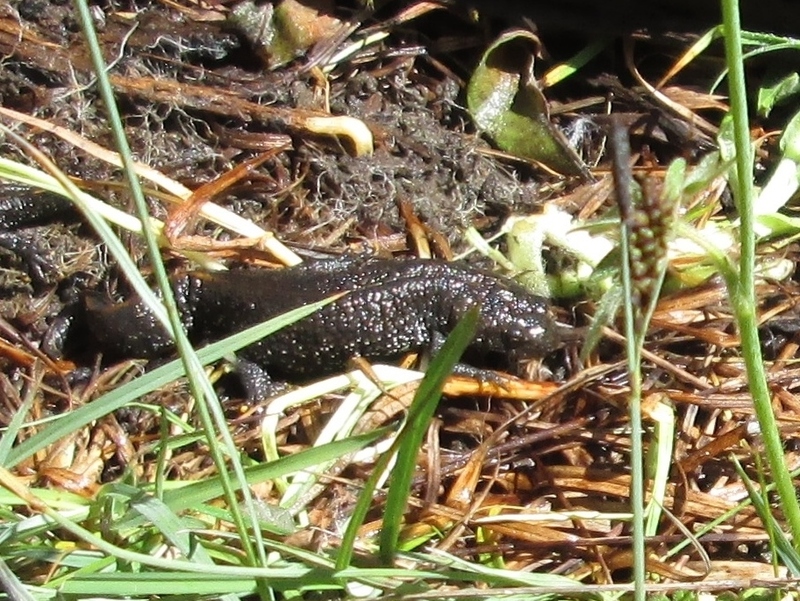 The highlight of the day for me was watching the courtship of two palmate newts in the pond. The male would swish his tale every now and then, and then shake it to waft pheromones to his beloved. She didn’t look too impressed, and we left without knowing if it ended happily ever after (hope so!). 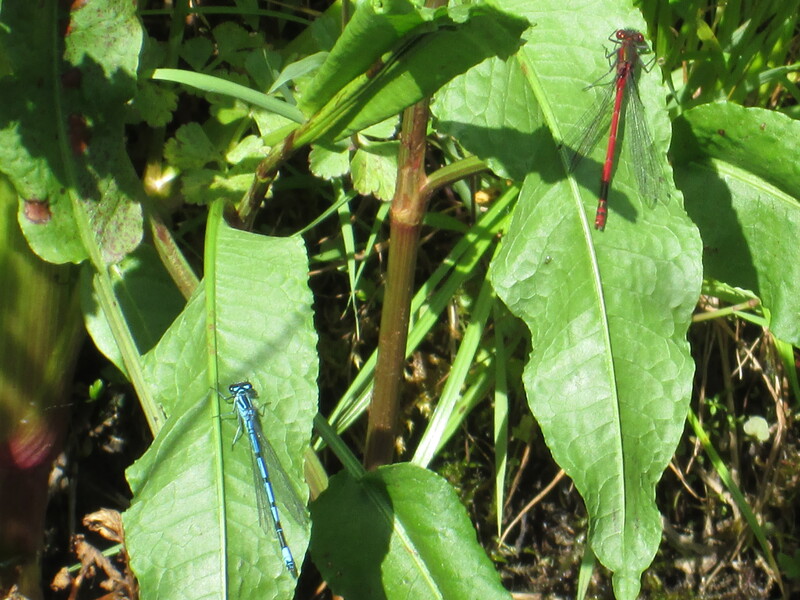 Sadly, I couldn’t get a photo of the newts, but did get these damselflies. 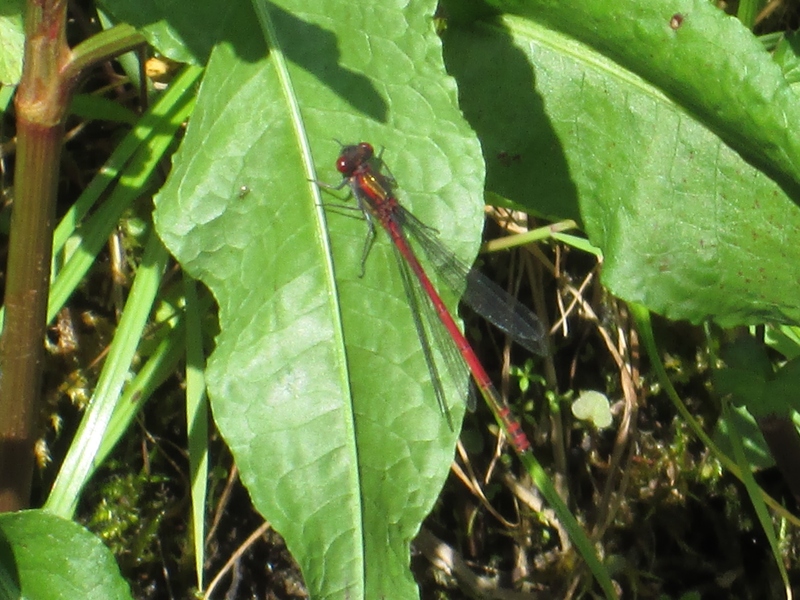 I’ve been told they’re an azure blue and a large red. 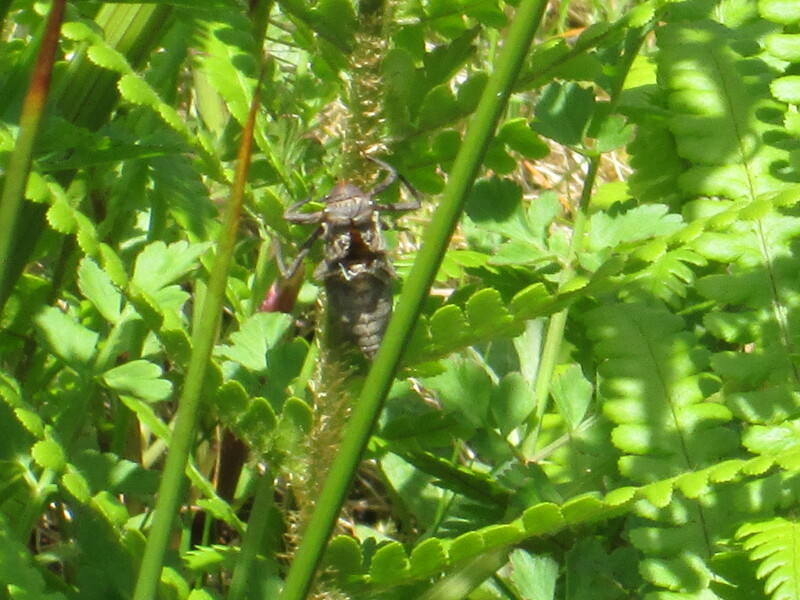 Someone did spot a dragonfly, but I missed it :-( We did, however, spot this dragonfly exuvia (shed skin) on an emergent plant. Sorry the photo isn’t great. Just love these things and again, wish I could have taken it home. Not sure my hubby would be too happy if I did though. 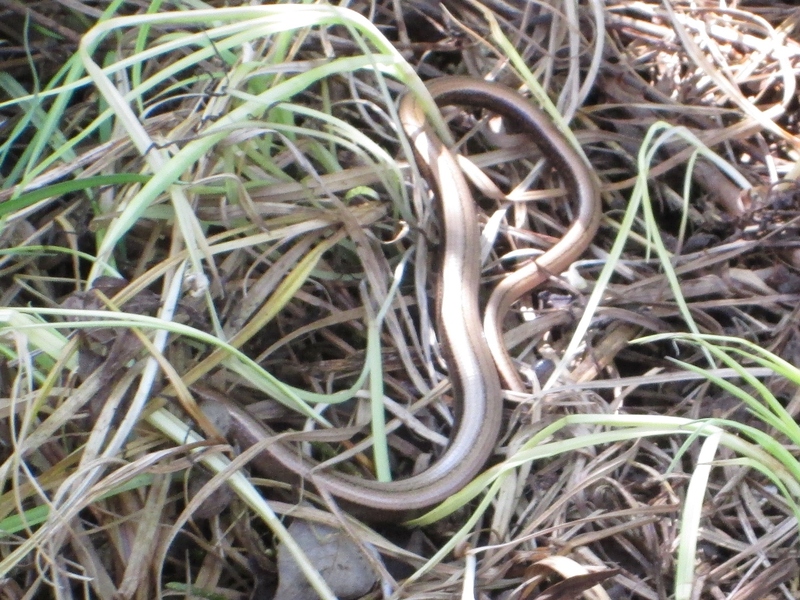 This female slow worm was so well-camouflaged that we almost missed it. 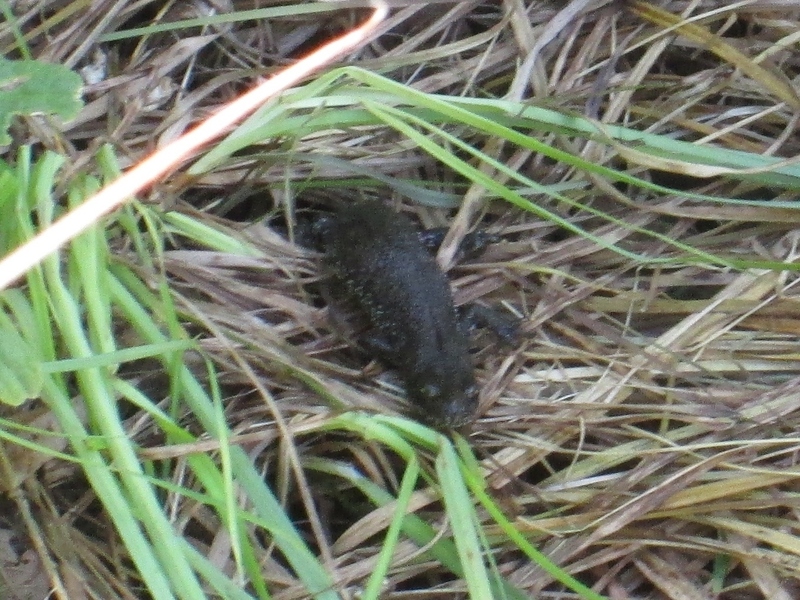 Last and rarest creatures we saw were some Great Crested Newts. Feel honoured to have seen them. To top off a wonderful morning, two ravens flew overhead, and just made my day! Thanks again to Rose, and to all at Parc Slip nature reserve. 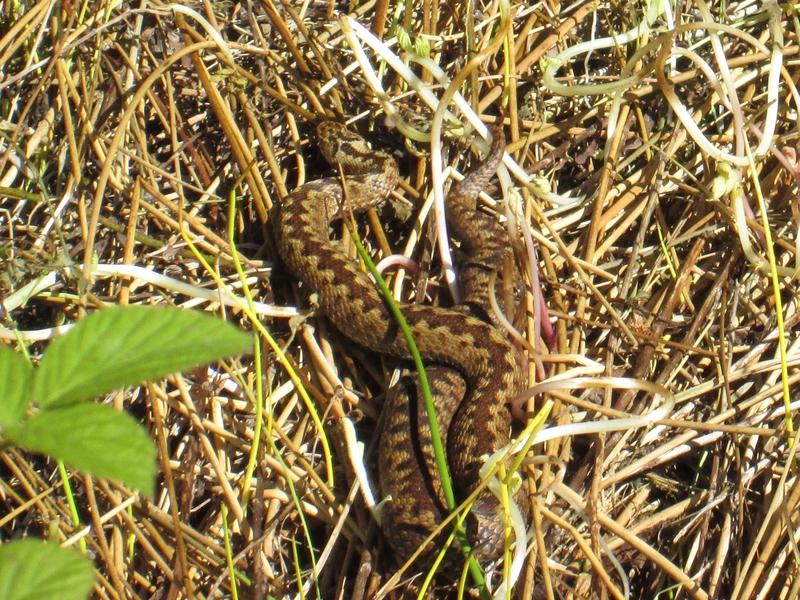 If you would like to join us on one of our weekly Reptile Rambles, please book with Rose Revera on r.revera@welshwildlife.org or 01656 724100. Visit the website to see available dates and more information.